In the department of stuff you come across while looking for something else, I found this radio show (the link brings on streaming audio). Click, and you can listen to a “thousands of GI’s” protesting “racial discrimination in state hiring,” and a kind of unusual ally has their backs: Superman, who flies in to stop the state troopers ordered to fire on the vets. Not unusual, it turns out, for the Superman radio show of 1940-1951, whose stories never appeared in comics and which also featured Superman vs. The Clan of the Fiery Cross (also known as the KKK). This is all old news to true geeks, and doubtless other better writers than I, like Michael Chabon. But I stumbled across it while poking around for something almost no one remembers (sort of my specialty): the American Veterans Committee. 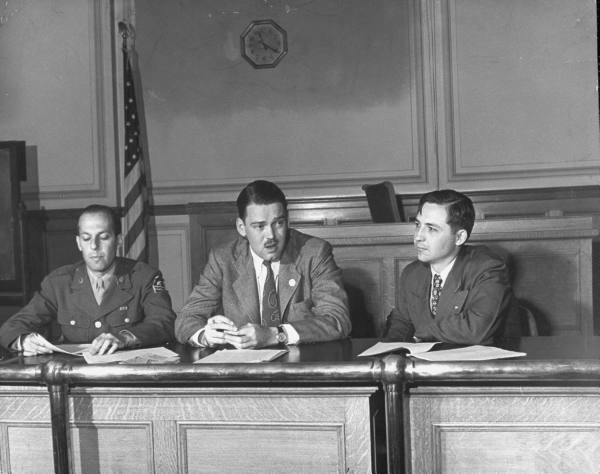 AVC was a short-lived World War II veterans’ organization whose slogan was “Citizens First, Veterans Second.” And that story about the veterans protest was grounded in the same reality that gave AVC nearly a million members at its start. Actually, the VFW had issued a similar award the month before, though it was for promoting “the American way” – code for crushing “commie” stuff like those “tolerant” Superman shows, which shut down in 1951 in favor of the commie-busting TV version. No place in the new Cold War for such thoughts — or for a veterans group that saw itself as composed of angelic troublemakers (e.g. sleeping in L.A. streets as a housing protest). By the time the 1954 Senate Subcommittee Hearings on Juvenile Delinquency tamed Superman completely, the AVC had mostly collapsed under a not-unfamiliar perfect storm of personality clashes, sectarian-left noise (snooze) and McCarthyism. Leaving veterans of that war to choose between the American Legion and the VFW, as odious to them as to many OEF/OIF vets now. Its founders basically did neither, choosing instead journalism, or film, or think tanks like the Carnegie Foundation for International Peace. What happened next is still happening: some will be in the book. Stay tuned for some character sketches. This entry was posted in book, history, human rights, journalism, military, organizing, politics, veterans, women, writing and tagged " Superman radio show, "greatest generation" and dissent, 1946 protests, American Veterans Committee, Charles G. Bolte, Clan of the Fiery Cross, Stetson Kennedy's "Adventures of Superman, Superman vs. the KKK on November 29, 2008 by chrislombardi.